Oh thank Canada for producing such brutal grind/death bands. 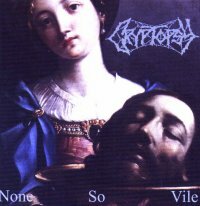 From the homeland of Gorguts and Kataklysm comes Cryptopsy's second release. Uncompromising, pounding, crushing, killing, maiming, disgusting death with superhuman drumming and hilarious lyrics (though they probably weren't meant to be). None So Vile reminds me of why I love death metal: Smashing riffs and psychotic solos under groin stomping double bass pedal drumming, so fast it should be illegal. 8 songs and a quarter of an hour of pure punishment, you'll want to hear it again and again. Gut wrangling vocals, emaculate production, grunts, screams, guitar heroism; it just keeps going.